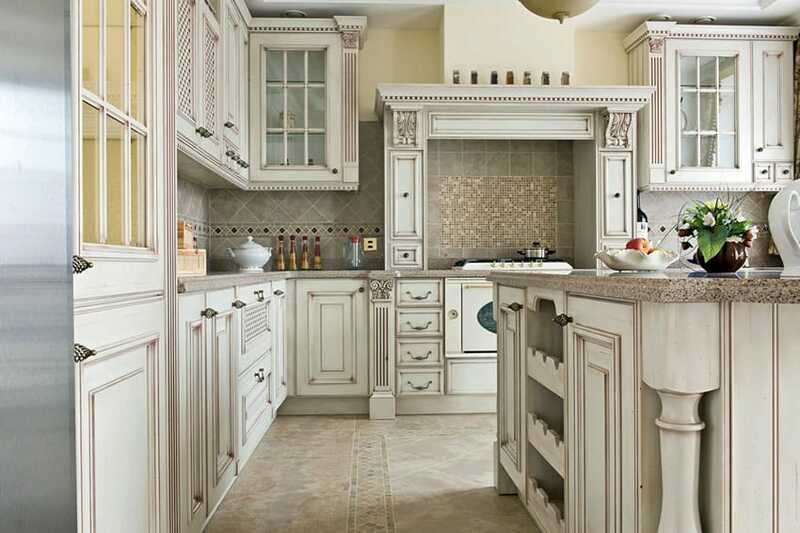 This page showcases antique white kitchen cabinets in a variety of layouts to give you ideas and inspiration. 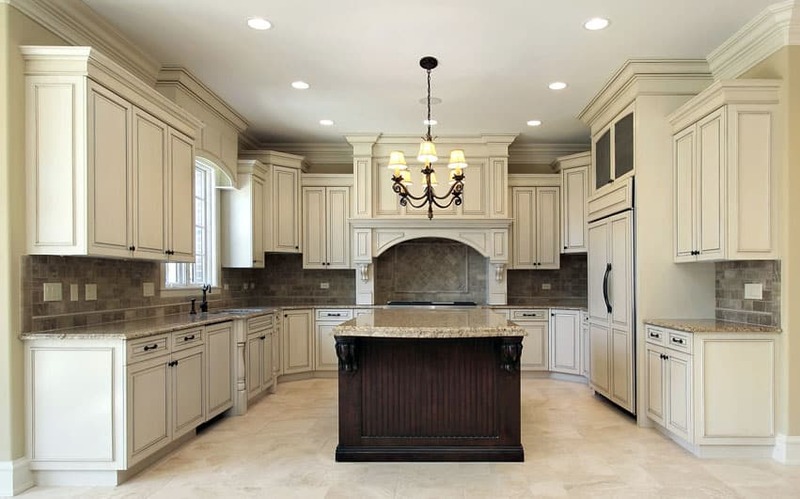 Kitchens with antique white cabinets are popular because they look beautiful and elegant. Often found in traditional kitchen designs the look of antique cabinets are timeless and highly sought after. Not only can antique white kitchen cabinets give your design an elegant ambiance, they can feel warmer than regular white. Kitchens with antique white cabinets can be matched with practically any color scheme. In addition there is not such a dramatic contrast when paired with dark countertops or flooring, when compared to regular white cabinets. The picture above features a classic luxe full-length white paneled kitchen cabinets along its back wall, complete with oiled brass handles and glass framed display cabinets. The stainless steel appliances recessed into the casework are signs of functional modernity, but the solid wood carved dining table, silver chandelier and trio of circular pendants over the wood-topped kitchen island bring elements of classical luxury to this kitchen. The dark rippling wood plank flooring completes the whole look of this white kitchen. 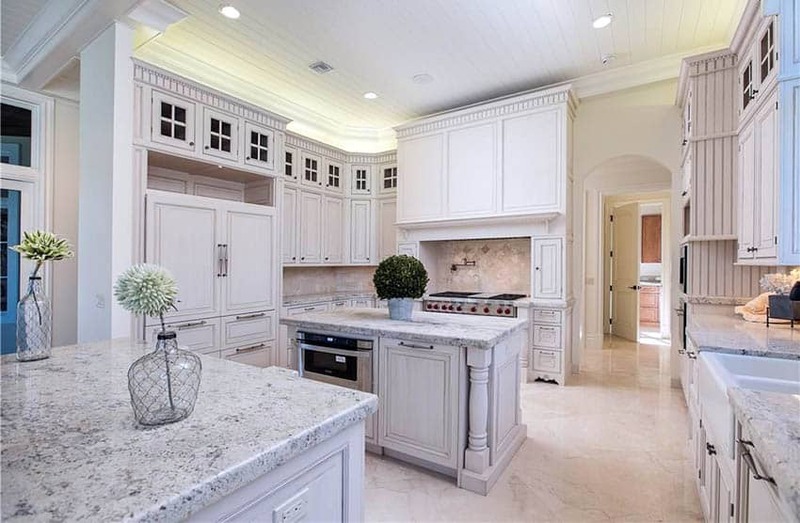 Antique white cabinets with Neo-classical trims, plinths and details give a Classical look to this all-white kitchen, particularly in its use of fluting, Ionic scrolls on its plinths and scroll-shaped brackets over the range hood. 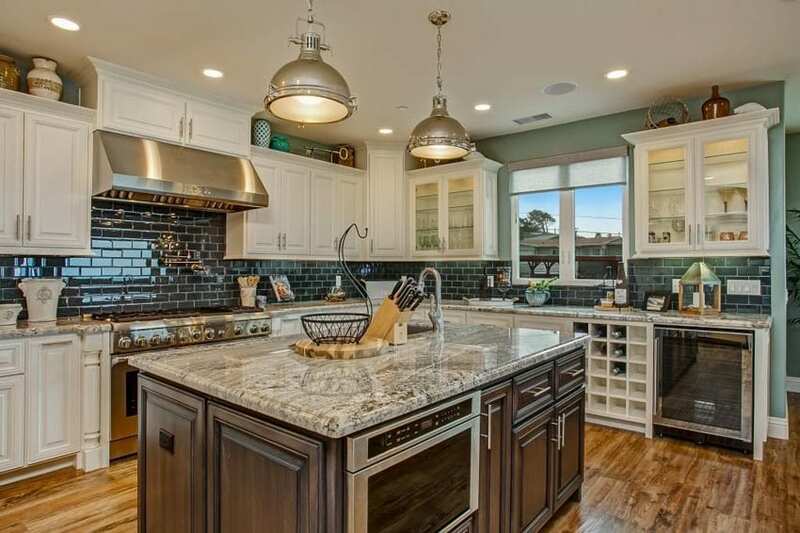 The use of glass framed cabinet doors and bronzed wrought iron cabinet handles also add to the vintage feel of this kitchen, and is continued by the beige tile floors, grey tiled backsplash and mosaic tile accent backsplash behind the stove top. Antique White cabinets make quite the statement with their highly detailed surfaces, glazed finishes, and carefully chosen hardware. Your paint color should support and continue that statement. That doesn’t mean that you have to go colorless, there are several tones that go great in a traditional space. 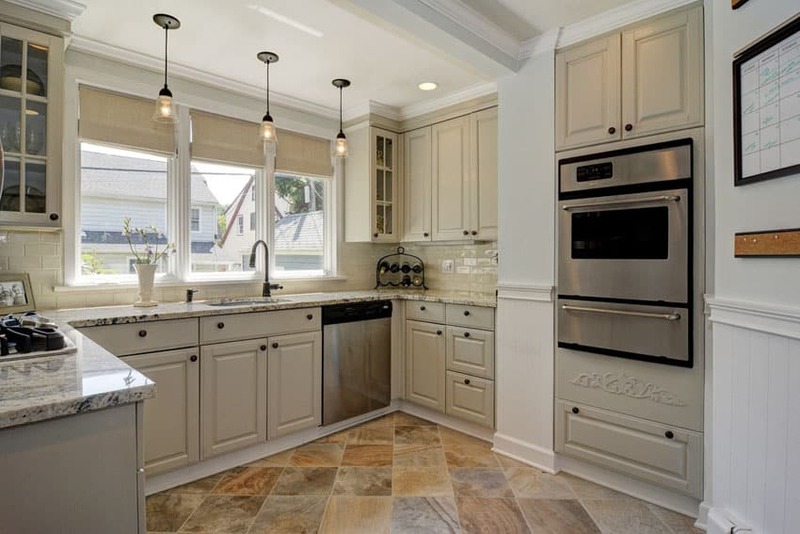 A great place to start for kitchens with white cabinets is with historical colors. Most paint companies offer a line of historical colors they can recommend. A light, muted grey or soft ivory are perfect if you want your wall to fade gently into the background without being boring. Muted Navy and toned down Paprika reds really make those white cabinets glow if you are a fan of darker colors. If you prefer something less neutral than reds and blues but not as neutral as grey or ivory, go with green. Not a bright jungle green, think more along the lines of the silvery green of sage or reedy green of sea grass. You can even echo the tones in your cabinet glaze, and go with a soft mocha or caramel. The trick is to stay muted, bold, bright colors will overpower the antiqued look of your cabinets and will look garish in such a traditional space. Make sure to choose a high-quality paint made for kitchens, this is not the place to use an eggshell finish. 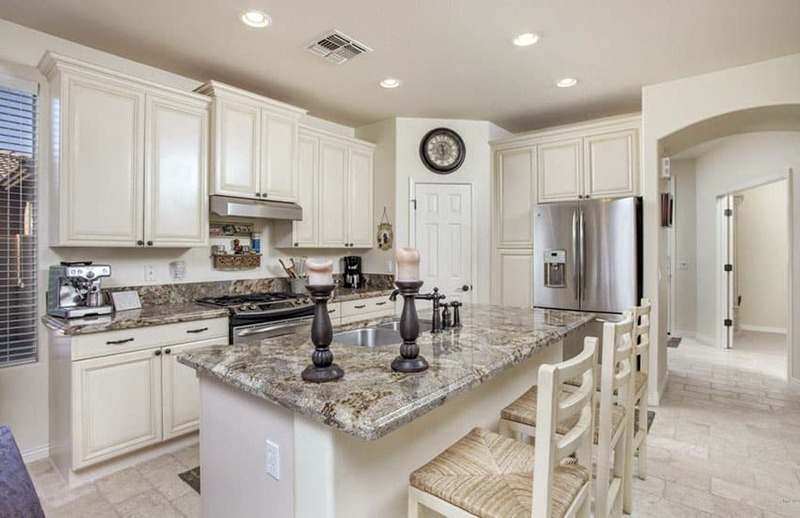 Take samples of your paint colors home, see how they live with your cabinets and countertops. It is really important to see how they will look in your lighting, the lighting at a paint store is not going to allow you to see how your lighting and finishes will affect the paint color. Simple white paneled kitchen cabinets and drawers with large-profile cornices are matched with vintage style black metal cabinet handles. The granite stone tiles used for the flooring are a classic element, matched with the quarried stone tiles used for the backsplash. 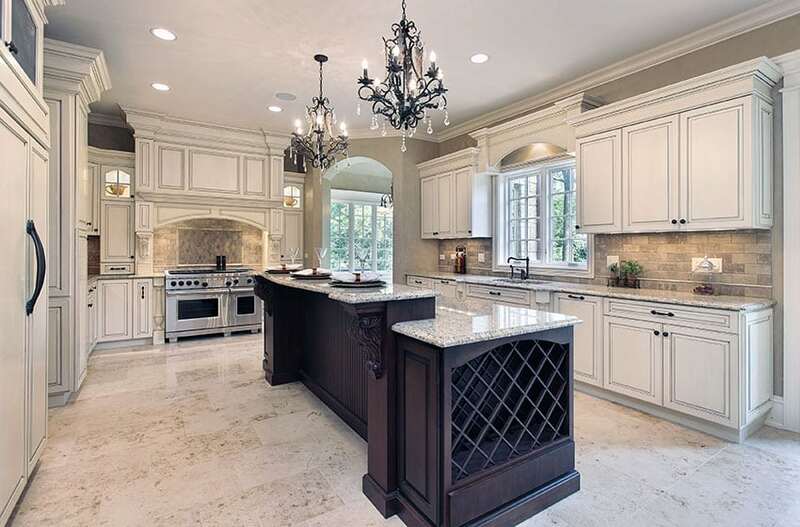 The kitchen island is made the centerpiece of the entire kitchen with its salt and pepper granite countertops in a double-level design, and held up by a rich dark wood base featuring a latticework for wine storage and ornate scroll-shaped brackets to hold up the breakfast bar. The pair of black metal and crystal chandeliers on top of the breakfast bar further give this kitchen an almost Southern vintage feel. You’ve decided on a look, traditional, antiqued, grounded in old world sophistication and splendor. You know you want granite, but you aren’t quite sure which color is best suited for your antique white cabinetry. A few pro-tips will help you on your way to making a perfectly harmonious, beautifully designed kitchen. 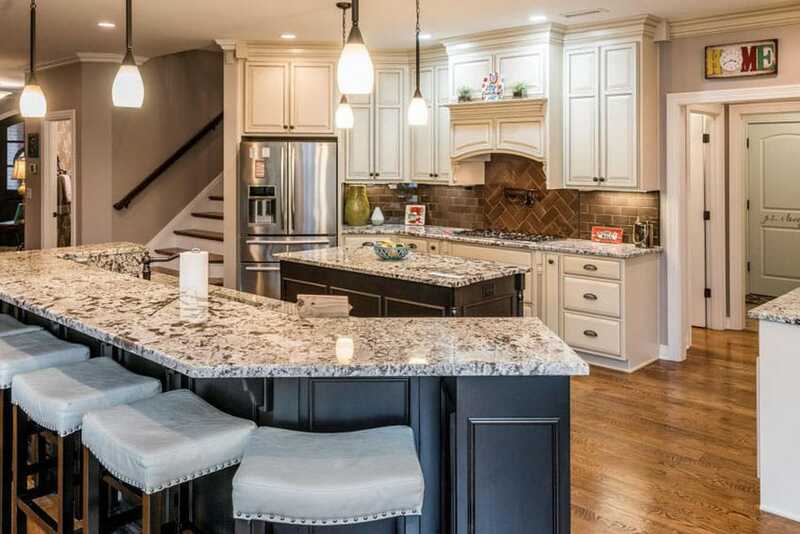 If you’ve glazed your cabinets with a glaze that brings out dark tones such as browns or back, go with a highly variegated granite with touches of dark brown. 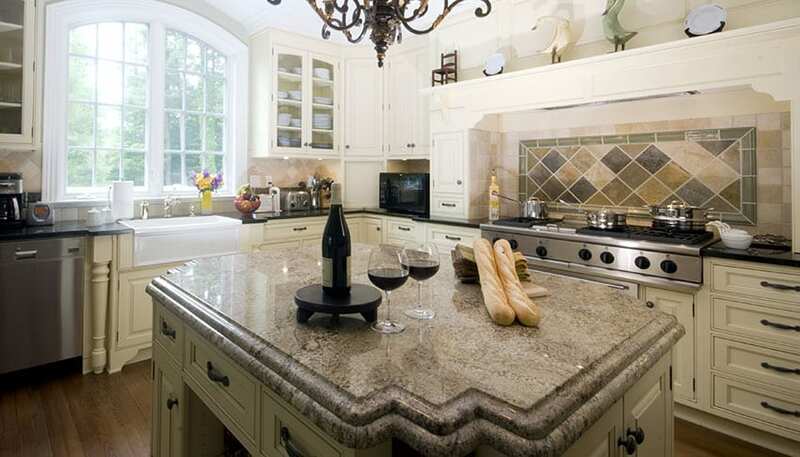 To bring in some color, find a granite that has small pops of muted colors such as Jade or a watery dark blue. Mocha glaze over white cabinets, cocoa granite, oversized stone tile flooring, and rubbed bronze fixtures look stunning together. Stay away from the solid granites as they read more modern. If your glaze is more towards the grey or black side, chose a granite that is mostly white with veins of soft grey and pops of black. A striated granite would look beautiful paired with glazed white cabinets, antiqued pewter cabinet hardware, and reclaimed walnut flooring. With cabinetry that has a more reddish glaze, granite in tones of russet and dark reddish-brown with flecks of bronze add that extra bit of warmth and tradition. When choosing granite for your antique white kitchen cabinets, try to keep the glaze and granite in similar color families. Chose granites that have more variation, too little variation can look jarringly modern in an antiqued space. Don’t be afraid to take a cabinet door with you to the granite yard or ask for a sample to take home, view it in different lights throughout the day, see how it plays with the other surfaces in your kitchen. This classic traditional luxe kitchen features simple white paneled drawers matched with ornate brass cabinet handles and hanging cabinets and shelves in a rich brown wood finish. The range hood also features a wood finish in its brackets, cornices and trims, and hangs over the vintage tile backsplash. 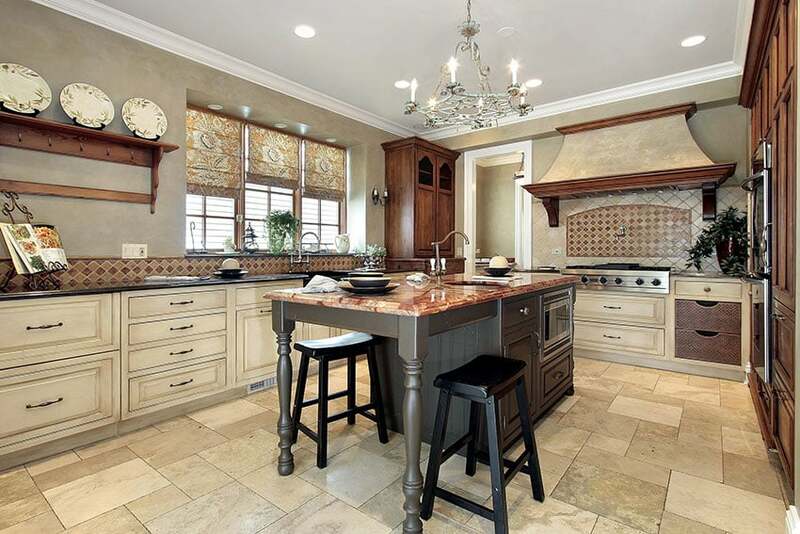 The beige random coursed stone tile for the flooring adds to the classical look, as does the kitchen island, highlighted by its painted brown body with pedestals and red granite stone countertop. A silver chandelier hangs over the kitchen island and brings unity to the vintage space. The kitchen’s off-white paneled kitchens and large pair of French doors display vintage elements while the black stone countertop and stainless steel wine fridge and wash basin contrast with a more modern feel. The trio of hanging lamps over the kitchen cabinet also add a vintage chic vibe to the bright, airy space. The Scandinavian wood strip flooring brings linearity to this open plan house’s kitchen area. The granite countertop of this rustic kitchen design features a vintage-style double bullnose termination at its edges, where it meets the plain white paneled drawers, decked with antique brass handles. The dark grey and beige framed accent backsplash behind the stove top is also a vintage addition to the all-beige tile backsplash, as is the plate rail created above the range hood. The warm wood flooring ties the whole kitchen together, while the wrought iron chandelier and arched windows further enhance the antique vibe of the space. The granite countertops and backsplash of this kitchen are a great accent piece to the all-white paneled kitchen cabinets and drawers with minimal design and small round oiled brass handles. Exuding an almost antique minimalist aesthetic, finishes such as rattan and stone are introduced in the country style chairs and sandstone tile flooring. 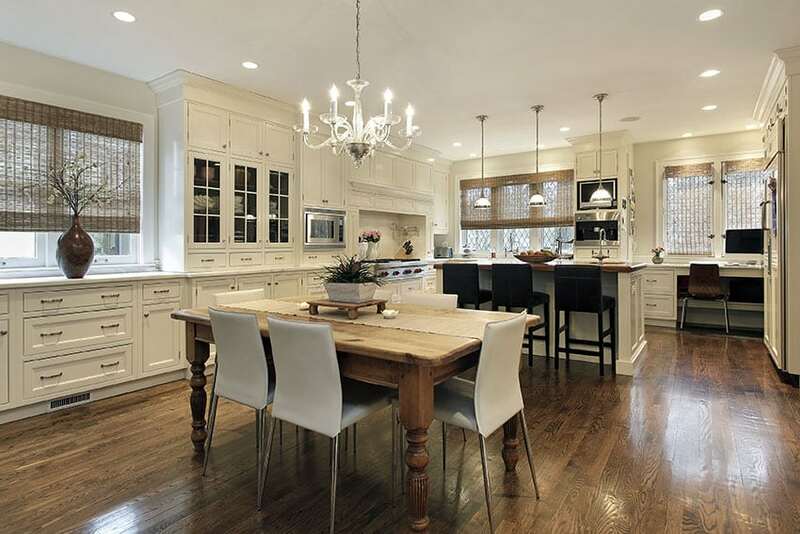 This U-shaped kitchen has great balance and symmetry, particularly in the way the kitchen island is set in the middle, right in front of the stove top and range hood with an architrave reaching up to the ceiling and decorated with white paneled casework, a plate rail and scroll-shaped brackets. Flanked by a set of hanging cabinets, the theme continues onto its sides where the large floor to ceiling casework built for the refrigerator stands equally opposite to the framed arched mullioned windows. 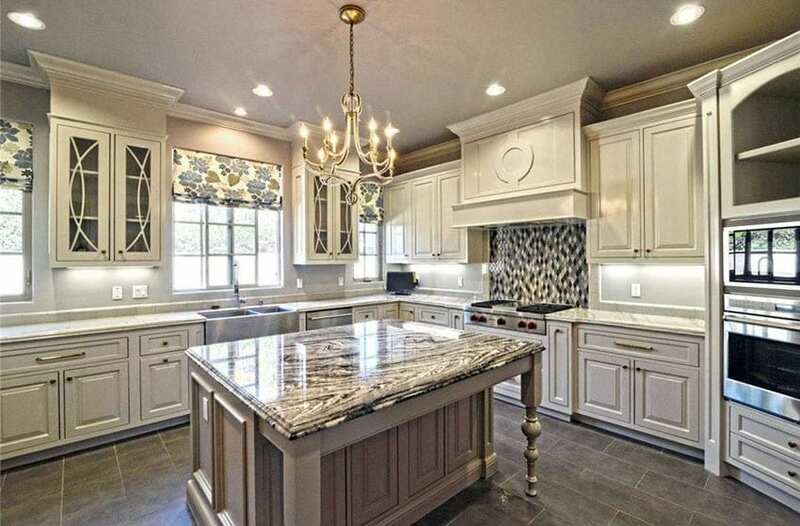 The centerpiece, the kitchen island, features a beige granite countertop, ornate dark wood casework and a wrought iron lamp shade candelabra hanging over it. The beautiful beige hues of this kitchen go well with the antique dark wood finish for the kitchen island base and black leather of the button-tufted barstools. A large stainless steel refrigerator and range hood with glass guard flank the beige granite countertop, also topped with a trio of hanging decorative glass pendants. 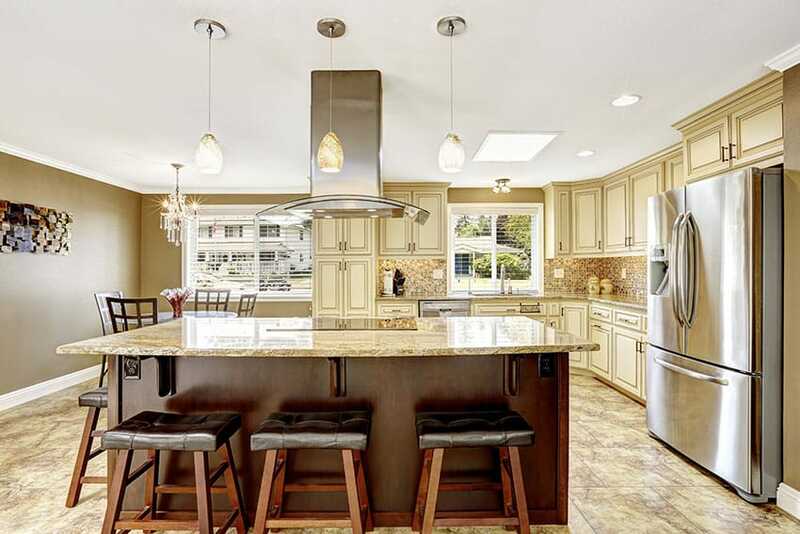 The darker beige walls of the kitchen complement well with the lighter beige paneled cabinets and beige and brown mosaic tile backsplash. This antique style kitchen features splashes of mint green on its walls, but the kitchen basically sticks to a more classic neutral tone. White paneled kitchen cabinets and drawers mixed with glass framed display cabinets set the tone for the antique style kitchen, and goes well with the beige and grey diamond tile backsplash and wood plank flooring. A pair of antique glass and brass orbs hang over an accent kitchen island with its beige granite countertop and black painted wood body with gold trim accents. 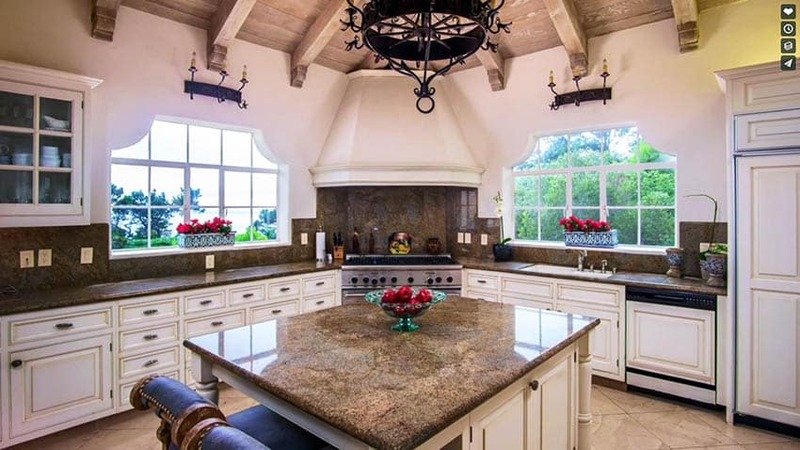 The antique white paneled kitchen cabinets and glass framed display cabinets in this antique style kitchen match well with the small sandstone tiled backsplash and larger random coursed sandstone floor tiles. The kitchen island serves as centerpiece with its beige granite countertop and dark warm wood paneled plinth and base. The chrome-finished gooseneck faucet on the island also adds to the kitchen’s vintage charm. What is glazing and how will glazed kitchen cabinets look in your space? Glazing is a technique in which a coating is applied to already painted cabinets. The coating can be transparent, semi-transparent, white, or darker colored. Glazing can be used to bring out the details on cabinetry and is especially popular for creating a beautiful, antique look to kitchen cabinets. A polyurethane topcoat will be applied once the glazing is cured, protecting your investment. If your look leans more traditional or country, glazing is an application that you should seriously consider, it will add that touch of antiquity that really pulls your look together. 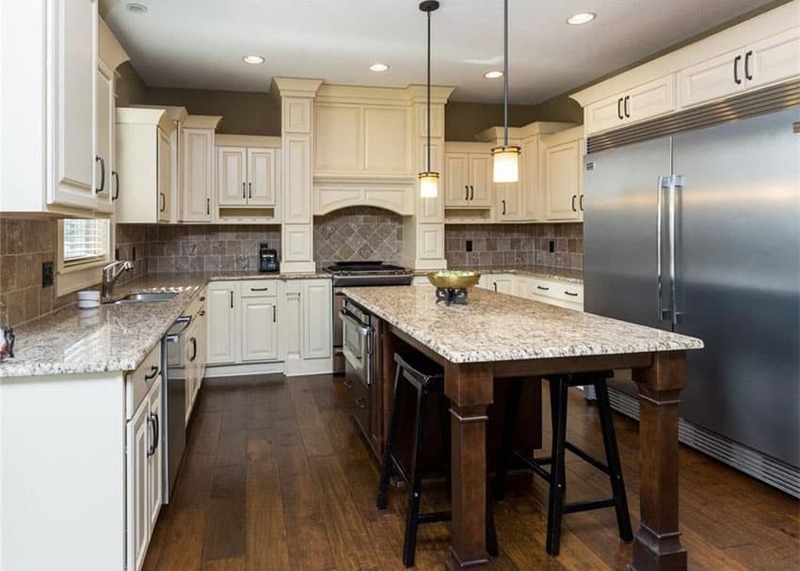 Create a subtle antique look with white glaze on white cabinets or a dramatic, traditional look that really brings out the details in your woodwork with a mocha or bronze glaze on white cabinets. The glaze will settle into the corners, carvings, and molding on cabinet and drawer fronts, giving your cabinetry an authentic looking antique patina. Whether your look is traditional or transitional, antiqued cabinets make a bold statement. Pair them with oil-rubbed bronze fixtures and heavy detailing for a more traditional feel. If you lean more country and have wainscoting detail on your cabinet fronts, the glaze will settle in and make your kitchen look warm and inviting. For a more transitional look, keep your cabinet details simple and use minimal, pewter or steel fixtures, the glaze will pair nicely with the more modern details and create harmony between the new and the old. Replace some of your upper cabinet door fronts with leaded glass panels, glazed kitchen cabinets combined with glass fronts can give even builder-grade kitchen cabinets look like custom-built works of art. If you are considering remodeling, look into glazing your existing cabinetry as an alternative to replacing them. Do the prep work, such as painting the base coats yourself, then hire the glazers to come in and do the finishes to help save a little bit of money. If you are purchasing new cabinetry, you can find pre-glazed cabinets or you can purchase the raw materials and choose your level of antiquing. For the budget-conscious, keep your existing traditional cabinetry as is and have your kitchen island glazed. It will add interest, depth, and warmth to your kitchen without taking over your entire remodel budget. You can also DIY your kitchen cabinets and apply the glaze yourself, there are several books and internet tutorials available to guide you, although this route is recommended for those with more DIY experience, it isn’t advised as a first DIY project. 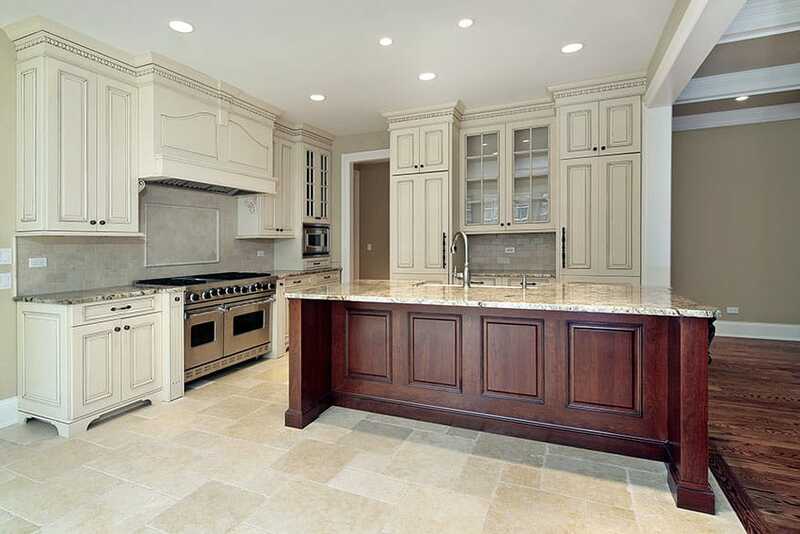 Glazed kitchen cabinetry is one of the best ways to achieve a traditional look in your kitchen. It tones down the harsh brightness of white cabinets, brings out the fine details of carvings and moldings, and adds a lived-in but sophisticated glow to your space. When paired with dark wood floors, granite counters, and ceramic or stone backsplash, glazed kitchen cabinets are the crown jewel, creating the look of a hand-crafted Old-World kitchen. This upscale kitchen features white paneled glazed kitchen cabinets, drawers and casework, and a double-level breakfast bar with black leather upholstered barstools. Grey and beige subway tiles run along the kitchen backsplash and is accented by a patterned tile above the stove top. A pair of bell shaped black iron and frosted glass lamps hanging over the breakfast bar add a vintage feel, as do the random coursed rough limestone tiles used for the flooring. This traditional luxe kitchen features clean antique white raised panel cabinets with a glazed finish and vintage brass handles whose profiles match the ornate brass chandelier over the kitchen island. The countertops are in a delicate Carrara marble finish, with the kitchen island, the main feature, having a dark wooden base with intricately carved scroll-shaped brackets and a chrome finished wash basin and faucet flushed with the countertop. 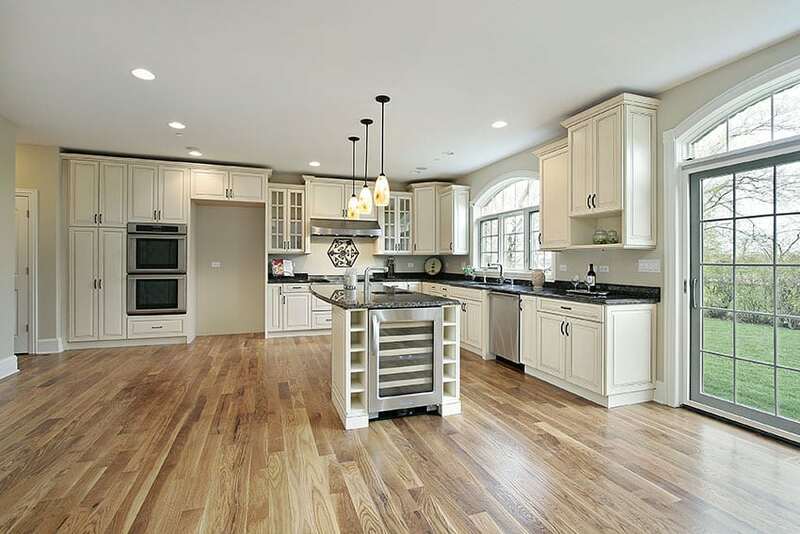 Warm walnut wood plank floors tie the whole kitchen together and accent with the cool white tones well. 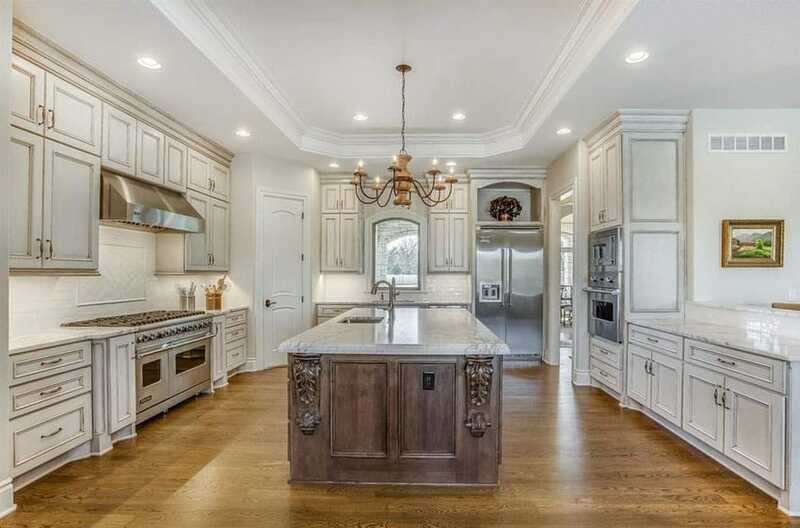 This kitchen features traditional antique white paneled kitchen cabinets and casework but mix with more contemporary, curvilinear profiles, particularly on the plate rail above the rangehood and the carvings over the glass framed display cabinets. 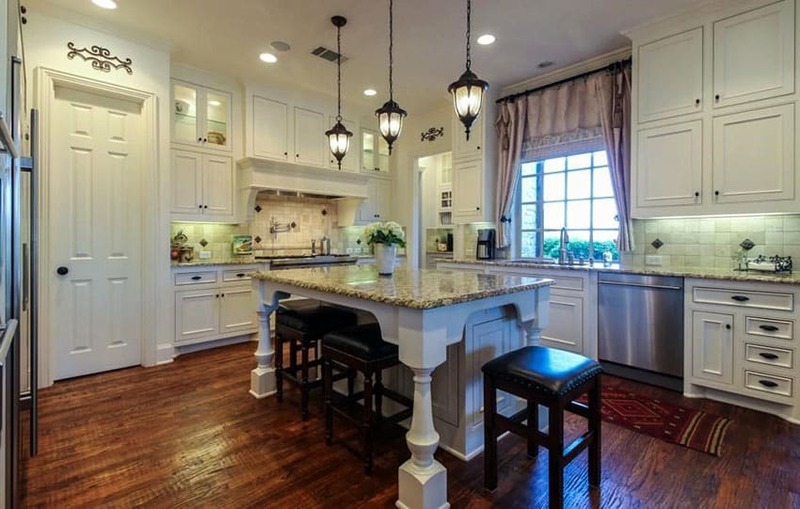 The double-bullnosed majestic granite countertop of the kitchen island also follows this Contemporary vintage scheme, as does the clean silver chandelier hanging over it. The mosaic tile backsplash behind the stove top is the final touch needed for this Contemporary vintage kitchen. This transitional style gourmet kitchen matches old and new elements, with the use of classic paneling profiles for the white kitchen cabinets, glass framed display cabinets and dark wood laminate for the kitchen island casework. Modern stainless steel appliances mix well with the classic granite countertops, black subway tiles, mint green painted walls and light wood floor planks. The pair of hanging metal pendants are the epitome of the transitional style with its modern finish mixed with vintage profile. This kitchen’s sand-colored walls are a great backdrop to its pristine white paneled cabinets and diamond-shaped porcelain tile backsplash. Classic elements in white also appear on the plinths and scroll-shaped brackets used to support the countertops. The Moroccan accent tile behind the stove top provide a vintage accent, as does the bronze hanging drum pendant over the kitchen island. Engineered wood floors in a dark mahogany finish complete the look and accent the lighter finishes used for the rest of the kitchen. 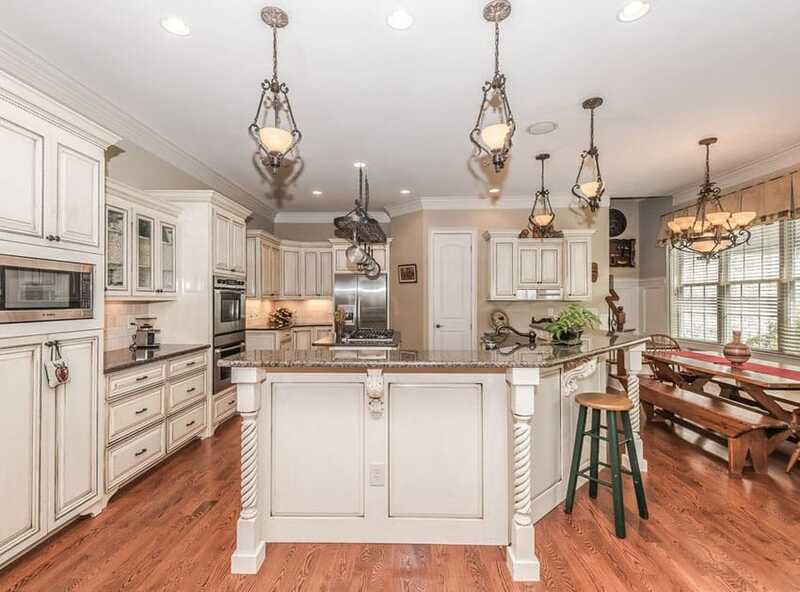 This transitional white country kitchen features stainless steel appliances seamlessly flushed into the casework, but Antebellum style glass and wrought iron lamps hang over the entire L-shaped kitchen island, as well as over the picnic-style dining table. The L-shaped kitchen island itself features spiral-combed plinths and scroll-shaped brackets holding up the salt and pepper granite countertop. A second rectangular kitchen island in the center is topped with a vintage-style pot hanger, while the rest of the kitchen walls are decked in distressed antique white cabinets. The red oak floors complete the entire look of this Antebellum style kitchen. White raised panel cabinets surround the floor to ceiling architrave above the range hood with the arched pelmet. Beneath the hanging cabinets are rough unfinished stone tiles in beige and grey, which go well with the white spotted granite countertops. The large stainless steel refrigerator adds modernity to the look and is matched by the pair of simple pendant lamps over the kitchen island’s ornate casework and wood carved plinths. 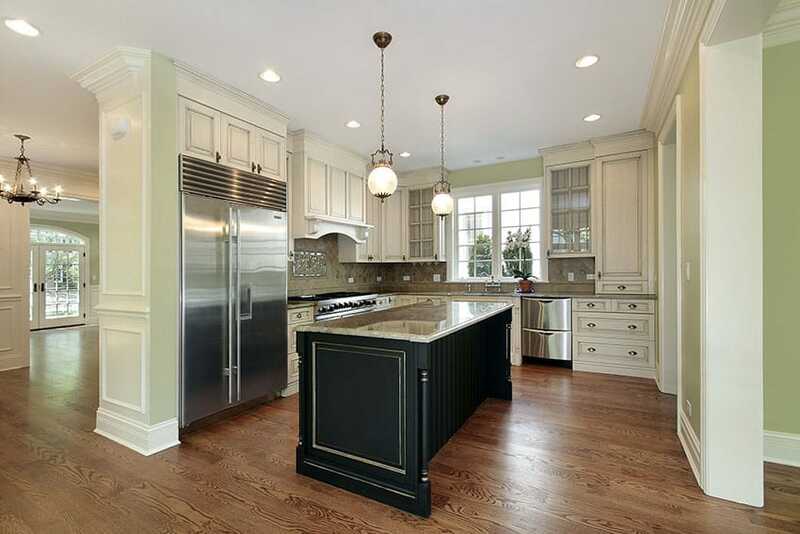 The dark wood strip flooring matches the finish used for the kitchen island base. 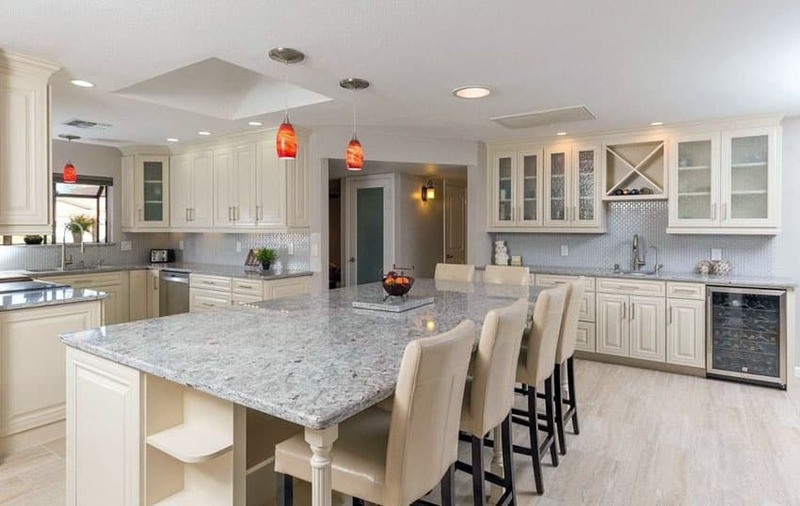 This Contemporary classic kitchen focuses on the pristine Andino white granite countertops resting on the raised panel cream kitchen cabinets and plinths. Glass framed display cabinets also feature in this kitchen’s casework, as does a cross-braced X-shaped wine storage shelf over the wash basin. A white mosaic tile backsplash runs along the tops of the countertops and matches the pale white wood flooring. A pair of spun glass pendants in red and orange hang over the breakfast bar and over the chrome-finished wash basin and faucet. A patchwork of orange, grey and brown slate tiles laid out in a diamond pattern on the floor provides a pop of color to this vintage style black and white kitchen. White figures mainly in the design, being used in the raised panel cabinetry, walls and ceilings, as well as on the white subway tile backsplash. Black accents come out in the oiled brass vintage cabinet handles, black speckled granite stone countertops and the trio of hanging bell pendants with a black base hanging in front of the picture windows looking out towards the yard. This traditional luxury kitchen’s layout features a kitchen island tucked in between the kitchen back wall and curved breakfast bar. The kitchen back wall features all-white raised cabinet panels and an arched pelmet and plate rail over the stove top and range hood. The backsplash is a brown brick subway tile, artfully tilted over the stove top to create an accent wall. The kitchen island features black and white granite countertops with a dark wood casework base, similar to that of the curved breakfast bar with studded white leather upholstery. Small black metal and glass egg pendants hang over the kitchen island and breakfast bar, while the back wall is lit by cool white downlights and undercabinet stril lighting. The dark maple wood floor planks go well with the white raised panel cabinets and casework, as well as the large slanted build-up over the range hood. Diagonally laid out subway tiles line the backsplash, with a black and white accent tile filling the gap over the stove top. The luxe antique black and white theme is continued in the black and white granite stone used for the countertops and the small minimalistic glass and black metal pendants hanging over the kitchen island. 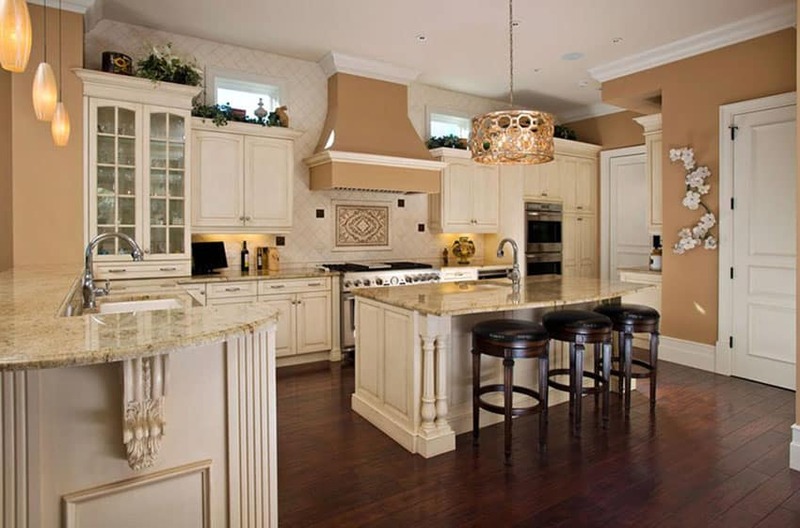 Beautiful antique white kitchen cabinets with an eat-in dining island topped with brown granite. The space features luxury elements such as a vaulted ceiling with wrought iron chandelier, French windows, hidden refrigerator and high end Viking oven. 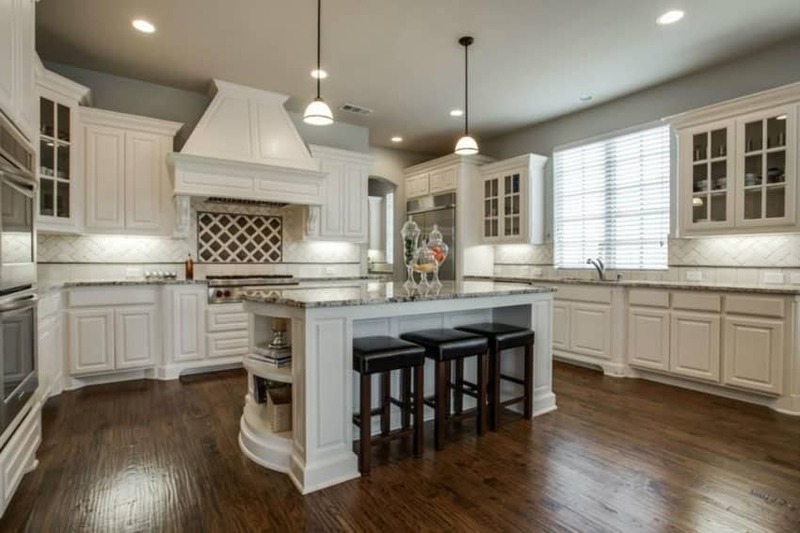 Antique white kitchen cabinets look beautiful paired with dark hardwood flooring and other dark color decor. In this kitchen a trio of hanging black metal and glass antique lanterns hangs over the kitchen island with its salt and pepper granite countertop and intricately carved white painted wooden plinth and body. Studded black leather upholstery was used for the barstools, along with a rough dark wood for the floor planks. 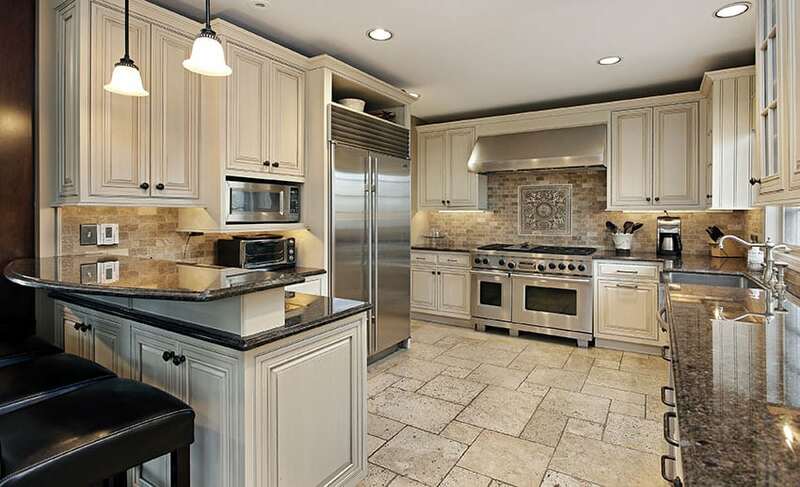 Lighter elements exist in the stainless steel appliances, white raised panel cabinets and square-shaped limestone tiles used in the backsplash. A vintage rug running along the dishwasher and wash basin add another vintage touch to this transitional style kitchen.